Do you find yourself fighting your bling to get them in place? Then this fabulous tutorial is for you! Now I don’t know about you but I love the Blingy Swirls but I hated fighting with them when trying to use them so I was bound and determined to figure out a way to use them so they would go where I wanted them to go and not stick to everything else. STEP #1: I got out some packing tape and stuck a few pieces together. STEP #2: Then I took the stickiness off by sticking it to my pants (yes these are my PJ’s it was really early in the AM before everyone was up, lol). STEP #3: Then I put the “used” tape with still some tack over the bling that I wanted to transfer and pressed it on top of the bling. STEP #4: Then I started to peel back the tape with the bling attached to the tape and it stayed exactly where I wanted it to be. Perfect! STEP #5: Then I figured out where I wanted it to be positioned on my project, pressed it down, and started pulling back the tape. Again this was perfectly in place! Here is the finished project with perfectly placed bling!!!! Now how simple was that! great idea...i often do nto buy this kind of bling for the same reason..now i will have to try again. Thanks this always stresses me when I move large bling. Thanks for a great idea and love the pj's. My favorite way to craft in the morning. What a great tip! I've always been a little intimidated by those because I can never seem to get them in place correctly. I'm really excited to try this. Great tutorial Theresa. 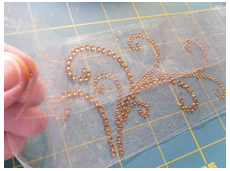 I will definitely be trying this with my next large piece of bling :) Thanks for sharing! fabby tutorial and fun tip!!! I'm definately going to have to give this a try!! Why did I not think of that? I'm not that crafty I guess...thanks for the great idea!